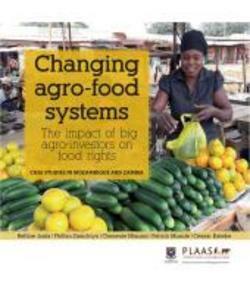 This book presents case studies on changing agro-food systems in Southern Africa within the context of large-scale land-based and agri-business investments. By capturing the testimonies of local people in rural settings, with a particular focus on small-scale farmers, it aims to provide vivid accounts of the micro-level changes underway in agro-food systems in Southern Africa, and to reflect the experiences and perspectives of local people. The book is an outcome of action research undertaken by the the Institute for Poverty, Land and Agrarian Studies (PLAAS) of the University of the Western Cape, South Africa, in partnership with civil society organisations (CSOs) in Mozambique and Zambia, namely Acção Académica para o Desenvolvimento das Comunidades Rurais (ADECRU) and Zambia Land Alliance (ZLA) respectively.